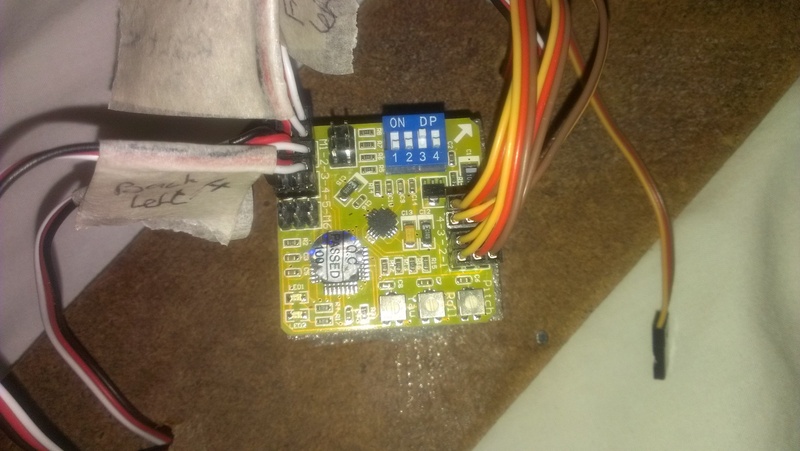 I connected everything up again and my i86 multirotor board is flashing red which means that its not getting a signal. Really not sure where to go from here. I have uploaded a photo of how I have everything connected up. Maybe I am doing something wrong. 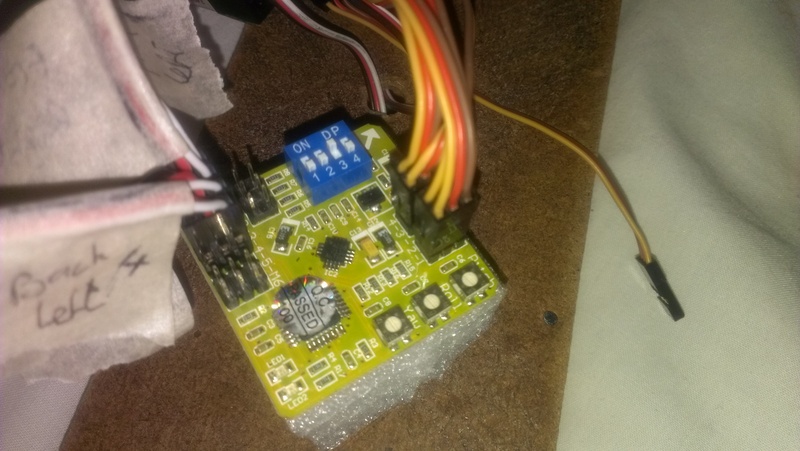 I connected an extra battery to the receiver when testing as I dont think it was getting any power with just the connections from the control board. Thanks guys if you can help me. maybe a stupid question, but did you bind your receiver? Yep the receiver is bound. 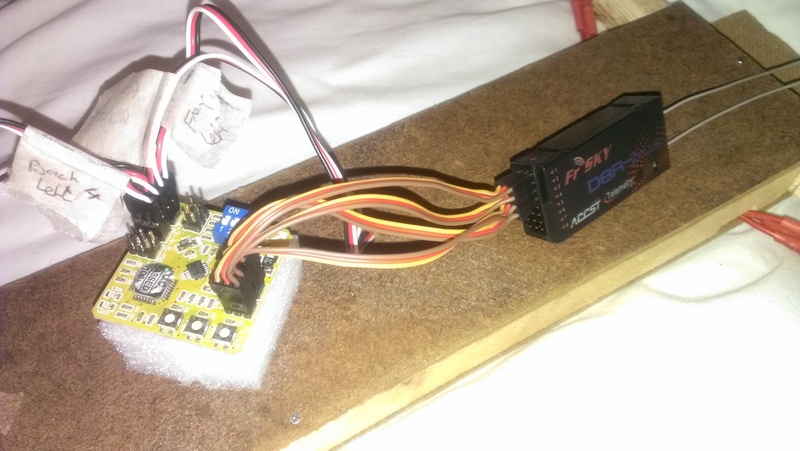 I have got slightly further now though as I have tested connecting the escs directly to the receiver and I can control the motors. So that end of things is working. manual of the i86 (http://www.hobbyking.com/hobbyking/store/uploads/406500306X7478X32.pdf) shows your cables are wrong way around. GND and signal on your i86 are switched, so turn the 4 wires from rx to i86 180 degrees and it should be working. Hopefully that will help me sort out the rest now. Noticed that too. Signal cables usually go towards the center of the board. Hi guys. Im back again after taking a break from this build. I have done the set-up of the i86 board as per the instructions but it doesn't seem to work properly. I am using a mode 2 Turnigy 9xr (Throttle on left) but to unlock the i86 I need to hold the left stick down and the right stick down and to the right. But when I do this it unlocks but the the throttle is the right stick. With the stick centred nothing happens but pushing the right stick up gives me throttle. Has anyone any ideas as to why this might be happening. Im guessing it could be something really simple but I havent a clue what it could be. You're getting signal but it's not going where it's supposed to go. Since you are mixing items made by different companies (Fr Sky and who ever makes to i86) don't assume that input one should go to output one. Chances are your throttle is connected into a aileron port which is why your right stick is now throttle and only starts at the neutral (see center) position. Then again, I could be all wrong, as I own neither the i86 or a fy sky receiver...but I did do some research for you. This is, by the way, exactly what Colorex posted... I'm just translating into another language. I based my opinion on this pdf page, which may help. Switch channels 2 and 3. Switch channels 1 and 4. The dip switches are correct. Most likely it's the channel assignments that are wrong. Oh and Paul, and the channel order doesn't depend on the module, it depends on the Tx. Or so I just read. The RF transmission module gets the signal from the TX in a specific order already. The module just transmits it to the Rx, which interprets it in the order it gets it. What this means is that a 9X with FrSky will not have the same channel order as a Spektrum with FrSky. Thanks for the tips guys. I will give it a try in the morning. Thanks guys. It turns out that it didnt really matter where the leads where plugged in as it could all be changed in the menu of the transmitter. I changed the throttle to channel 3 with some offset and its working the way I would like it. Now to check the motors are spinng the correct way, the gyros are working the right way and then attach my props. Anyway, I fired it up and as you can see from the video below its not running right. The motors are not running at the same speed as each other. The front left seems to be fastest followed by the left rear, right front and then right rear. Im not sure if you can make it out but in the second part of the video I adjusted the trim settings on the transmitter but it didn't make it any better. What could the reason behind this be? Had my first crash this evening. I thought I had the esc's properly calibrated but it seemed not. The props were spinning at a much closer rate than in the above video but the left hand side ones were just a little bit faster. I held the right stick down and the copter took off quite level to about 2-3 feet above the ground. Any movement of the right stick and it was unstable. It eventually went by itself, flipped over and hit the ground. It broke a prop broke some solder joints and pulled the front boom arm away from the top and bottom plates. Its all relatively easy to fix lucky enough apart from figuring out what was wrong in the first place. It really has me stumped.